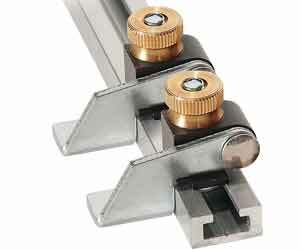 Our Aluminum T-Track System makes an endless variety of jigs and fixtures. Build a system to hold your stock securely in place (for any application in your shop), or use it to secure your router fence. Great for use with a drill press table, router table, shaper table, band saw table, table saw, workbench and miter gauge. NOTE: All T-Track lengths may vary up to 1/8". Precision extruded aluminum track. Pre-drilled for mounting. Can be cut to shorter lengths, if needed. Overall size is 3/4" wide by 3/8" height. "Mini" T-Track is made to hold a 1/4" X 20 TPI bolt. Machined aluminum with knob and bolt. Use on workbench or drill press table. Can be used with your jig or adapted to use with our T-Tracks. Soft flexible plastic with two knobs and two bolts. Will not shatter or damage bits if accidentally cut. Can also be used with table saws or shapers. Melamine coated with one bolt and one knob. Designed with two mounting holes. Works with MLCS router tables (except tables #9460 and #9463). Fits router table fences, drill press fences, and more. Great hold-down power and anti-kickback safety. Includes two T-head bolts and two knobs. Compatible with MLCS Precision and Heavyweight router tables. Mount a featherboard in the miter T-slot of your router table, table saw and more. 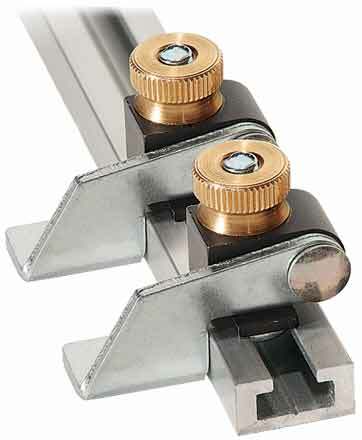 Includes a miter T-bar with locking knobs, two threaded bolts and two knobs. G Kit #9480 includes 24" T-Track, featherboard, 2 knobs and 2 bolts. 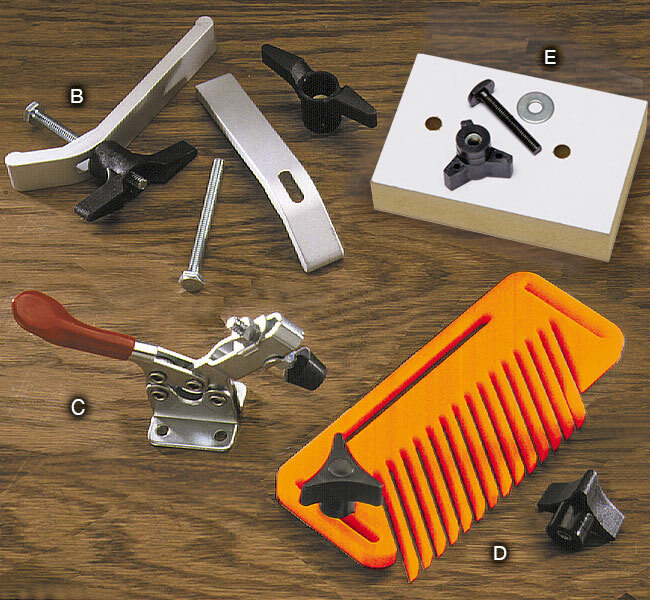 H Kit #9481 includes 24" T-Track, 2 hold down clamps, 2 knobs and 2 bolts. 1 knob and 1 bolt. SAVE $18.90! Includes #9480, #9481 and #9482. 2 knobs and 2 bolts. H Kit #9486 includes 36" T-Track, 2 hold down clamps, 2 knobs and 2 bolts. SAVE $16.90! Includes #9485, #9486 and #9487. Nice straight machined aluminum t-track with countersunk holes. Only problem I had with this purchase is that for $17 (I bought the 36" length), one would think there would be a few screws to mount the thing. I know a few screws are pennies in the grand scheme, but not having a few on hand with the right head pitch causes a trip to the hardware store. Now I drive to the hardware store to get a few penny screws and have spent another buck or two in fuel for something that should be included. Making accurate repetitive cuts has never been easier. 2 Piece Set! Adjust location of the flip stop on fence by using the brass knob. Flip stop up and out of the way for rough cuts. Flip the stop into place for precise finish cuts. Use with standard MLCS T-Track that accepts a 1/4" Hex head bolt. These flip stops are made for a low profile fence and are solidly built.I'm using them on my drill press fence and they are accurate and work easily.And at almost half the price of other flip stops on the market, these are a great value. They actually didn't fit the track I'm using them on , which is a different brand than from MLCS. But with a little filing I was able to modify them to fit. These Flip Stops are an excellent value and product. They are all metal construction unlike others on the market and fit the track very snugly preventing movement once set. I have found that they are a real time saver when I have used them with my chop saw. I would recommend them to others. Make stock slide like glass! 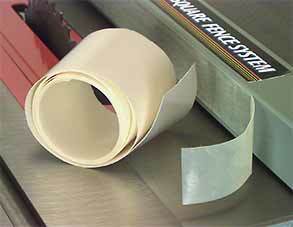 This special plastic film creates a frictionless surface area for your stock to glide against. These self-adhesive strips can be cut to desired size. Ideal for fences on saws, router tables, shapers and more. Three foot (36") slick tape roll. .030" thickness.